Best-selling author Jonathan Franzen, a birder, once shared his perspective on the hobby and it stuck with me. He said adding birds to his life list is not the point. He does it, instead, for the experience. Speaking to Audubon magazine in 2013, Franzen explained that pursuing species you haven’t seen before is a way to force yourself to have experiences that you otherwise would not. He’s right. Birding takes us places, often to locations a tourist would never go. Some of those places are hidden gems. Others, not so much, like stinky landfills and sewage treatment plants. The birds at Ding Darling are plentiful and easy to observe. 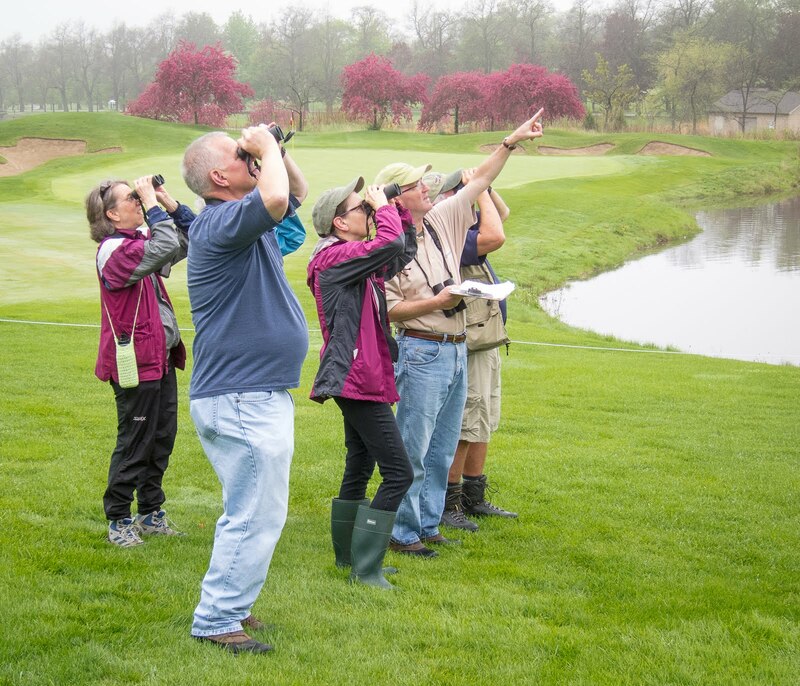 It’s a birder’s playground. My only regret was not having more time. Well, maybe one more: I didn’t find a mangrove cuckoo. But the odds of seeing a cuckoo, I knew, were extremely slim. For now, it stays on my Most Wanted list. I’d never hired a private guide before, and when a Subaru pulled up labeled “Birding with David Simpson” I knew this was the real deal. My adventure was about to begin, and the meter was ticking. David, of course, knew exactly where to go. An hour later we were in pre-dawn position at Three Lakes Wildlife Management Area, roughly 25 miles south of St. Cloud. 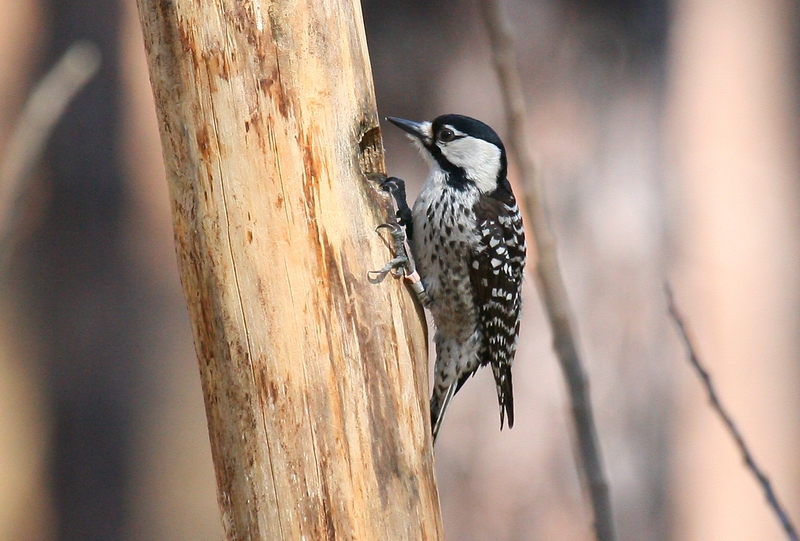 The diverse 85,000-acre site includes patches of the mature longleaf pine forest that red-cockaded woodpeckers prefer. The viewing protocol is to locate an active “cluster” (social group) of the rare woodpeckers and be there when they wake up. David parked near a particular roost hole—about 25 feet up in a longleaf pine—and set up his scope. The preserve was alive with bird sound as we waited. David’s trained ears detected far more than mine but among the louder calls were Northern bobwhite, Carolina wren and barred owl. Around 6:45, a face with distinctive white cheeks poked out of the hole we were monitoring. It looked around, surveyed the scene, and went back inside the roost. Moments later, the bird reappeared, paused, and then flew out, presumably in search of breakfast and to reconnect with other birds in the colony. 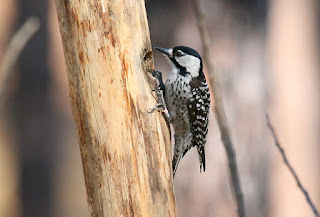 During the next hour we’d see several more red-cockaded woodpeckers, moving about from pine to pine, mingling with brown-headed nuthatches, Eastern bluebirds and more pine warblers than I’d ever seen in one place. At one point a Bachman’s sparrow popped up from the wet, knee-high vegetation, my second lifer of the morning. A bit later we lucked upon another Bachman’s that posed in the open at short range. Sweet! Could I have found red-cockaded woodpecker and Bachman’s sparrow on my own, without David Simpson? The woodpecker, maybe; Bachman’s, probably not. Without David’s help I’d have missed a bunch of other birds, too. Plus, my morning at Three Lakes would have been far less educational and fun. 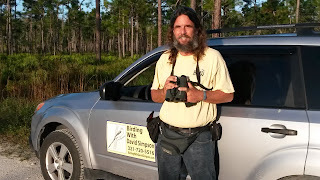 David, age 45, offers a fine combination of birdfinding skills, Florida birding knowledge (the whole state) and good company. His half-day rate was $175, before tip, and I happily paid it. Mostly I was happy to finally add red-cockaded woodpecker to my life list. Birders with sharp memories might recall the state-record red-cockaded that visited Illinois Beach State Park (Lake County) in 2000. 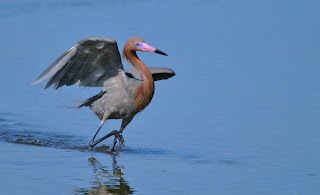 I missed seeing that historic bird at IBSP. But now I’ve witnessed the rare woodpecker where it truly belongs, and I appreciate more than ever the efforts being made to save it. Birding, once again, took me to a new place. Franzen commented that you see a very different Italy if you’re looking for birds in Italy. That certainly goes for Florida, too, and I suppose even DuPage County. You never forget a special bird, and you’ll always remember the experience of finding it.